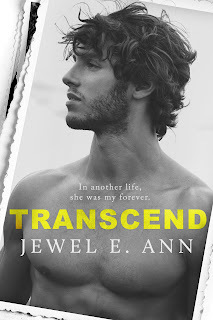 Ah, I do love me a Jewel E. Ann-penned novel, and Transcend, the first in her duet by the same title, isn't just a new novel, but it tells a tale that's different from anything else the author's published so far. We first meet Swayze Samuels when she's eleven and sitting in the waiting room with her parents at a doctor's office. Pretty soon, it's clear that Swayze isn't your run-of-the-mill preteen. As a matter, there's always been something different about here--something extraordinary, and her true purpose doesn't reveal itself until a decade later. She takes a job as the nanny to the baby of thirty-six-year-old single father, widower, and professor Nathaniel Hunt. Swayze and Nate have never met before, yet she seems to know things about him that no one else should...no one except his best friend, Morgan Daisy Gallagher, the same best friend he named his infant daughter after. Soon, the connection between Swayze and Nate is entangled with his past and her present, one that also involves her boyfriend, Griffin Calloway. Could this be a love story that transcends time...and death? Learn more about Jewel E. Ann.